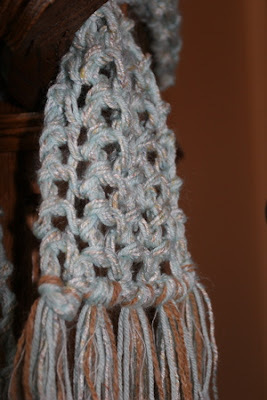 Notes: The most time-consuming part of this scarf is finding the yarn, but that was a fun task! I loved finding different yarns in similar colors in different parts of the LYS and seeing how they look paired together. 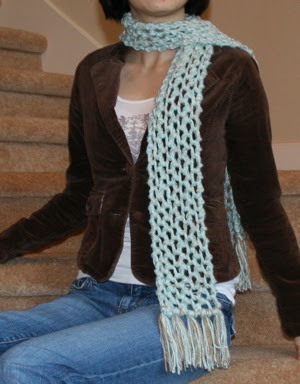 I did also experiment with using a tan-colored tweedy yarn (the Kathmandu Aran) because it complemented the light aqua really well, and there are even flecks of tan in the Silk Aran. But it didn't work out well since it made the stitch pattern look...I don't know...too busy or odd or something. I think you either need to stay will all the same colors or else use all different colors as it didn't seem to work blending a single skein of one color with 3 skeins of a different color. I did use the tan a little bit for the fringe. 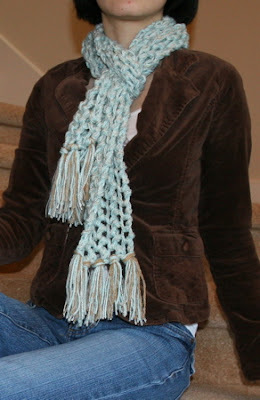 The scarf itself was very quick to knit--I cast on and cast off on the same day, so it's perfect for gift-crafting. All of these yarns feel great! The scarf is warmer than you might imagine a lacy scarf to be because the mesh on the part that gets wrapped around your neck essentially collapses down, so you don't have just a bunch of holes around your neck. The pattern could hardly be simpler. It is thoughtful in that it asks you to cut yarn for the tassels first. And then you just knit and knit till you run out of yarn, and then you bind off. That way there's no guessing about whether you have enough for tassels or not. I'll have to remember that little tip for future reference.